The Pegasus2 R6 from Promise is the first Thunderbolt 2 peripheral to make its way into the Macworld Lab. 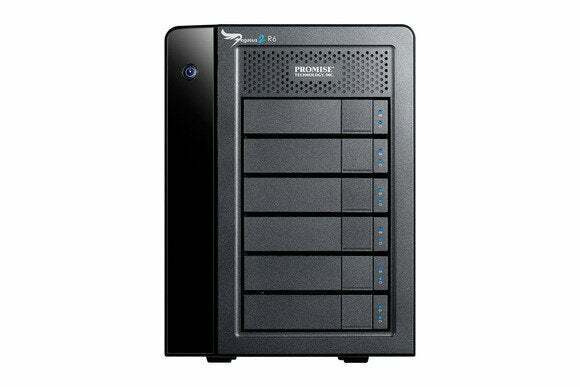 It’s a six-drive 12TB hardware RAID box and can be purchased from the Apple Store for $2299. The Pegasus2 R6 we received has six 7200-rpm hard drives with 2TB of capacity each, the same capacity as the first Pegasus we tested. 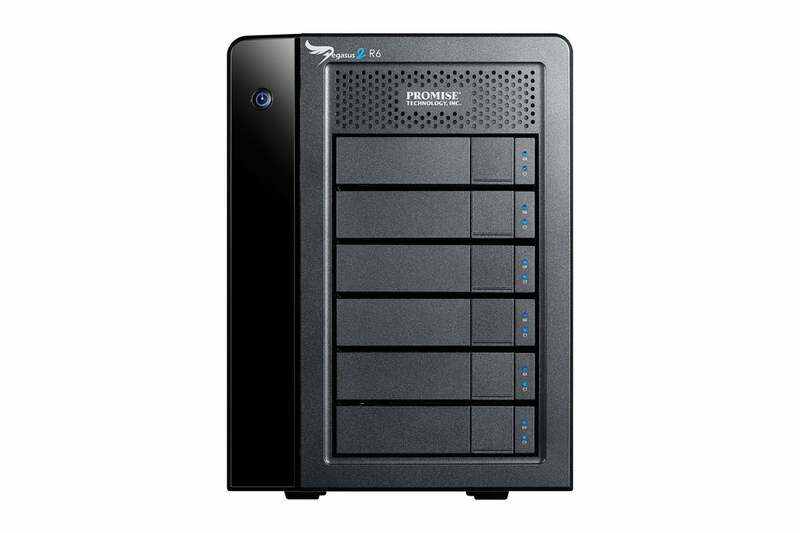 The Pegasus2 is a hardware RAID that comes preconfigured as a RAID 5 array, but can easily be changed to RAID 0, 1, 10, or JBOD using the included software. The Pegasus2 has a black aluminum case to better match the design of the new Mac Pro and has two Thunderbolt 2 ports to allow for daisy-chaining up to six compatible devices. Thunderbolt products with just one port must sit at the end of a daisy chain. Having two Thunderbolt 2 ports gives you more flexibility—you can connect more Thunderbolt 2 devices. Thunderbolt 2 is an update to the Thunderbolt specification that takes the original’s two 10 Gbps bi-directional channels and combines them into a single 20 Gbps bi-directional channel. The amount of data able to move through a Thunderbolt connection hasn’t increased, but the throughput of a single channel has been doubled. Thunderbolt 2 is backwards compatible with Thunderbolt devices, but those devices will run at the slower 10 Gbps speed. To see how fast the Pegasus2 R6 is, we ran a series of tests on a Mac Pro with Thunderbolt 2 and 2013 MacBook Air with Thunderbolt, with the drive in its default RAID 5 configuration. We ran the tests on a first-generation Pegasus R6 with the same drives as the Pegasus2. The Mac Pro tests showed the Pegasus2 hitting nearly 900 MBps reading and writing in our 6GB files and folders test— about 20 percent faster than the first generation Pegasus. The new Pegasus2 was 15 percent faster writing and 18 percent faster reading in our 6GB large file test than the older Pegasus. We retested the Pegasus2 in RAID 0 mode, a faster configuration than RAID 5, but without RAID 5’s data redundancy—if one of the six drives fails in a RAID 0 array, all of your data is lost. These striped tests showed the Pegasus2 to be between 22 and 30 percent faster at writing data than the same device in RAID 5 mode. Black Magic Disk Test and AJA System Test both showed the RAID 0 Pegasus2 topping 1100 MBps writing and anywhere from 800 to 963 Mps reading. Compared to a LaCie 5Big Thunderbolt drive also configured as RAID 0, we found the striped Pegasus2 to be about 50 percent faster writing and 20 percent faster reading than the LaCie, overall. We also connected the Pegasus2 in its fast striped configuration to a late 2013 MacBook Air with the previous iteration of Thunderbolt. The Mac Pro write tests averaged about 40 percent faster than the Air tests, while the read tests varied from just 9 percent faster than the Air in large file test to 29 percent faster in the files and folder test to 40 percent faster than the Air speeds in the AJA System test trials. Just for kicks we decided to try striping six SSD drives in the Pegasus2. There wasn’t a huge difference in our file and folders tests, in fact writing could be a couple percent slower on those SSDs, but was averaging about 20 percent faster read speeds over the standard 7200 RPM drives that the Pegasus2 shipped with. If you need storage with the fastest available throughput for your Mac Pro workflow, there’s only one game in town. While others will, no doubt, follow soon, the Pegasus2 is the only Thunderbolt 2 enabled drive available for purchase today. 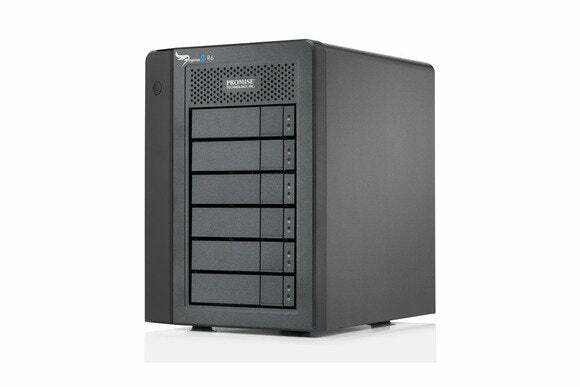 It offers six drive bays, dual Thunderbolt 2 ports and can be configured in many RAID varieties, and tops out at around 1100 MBps.